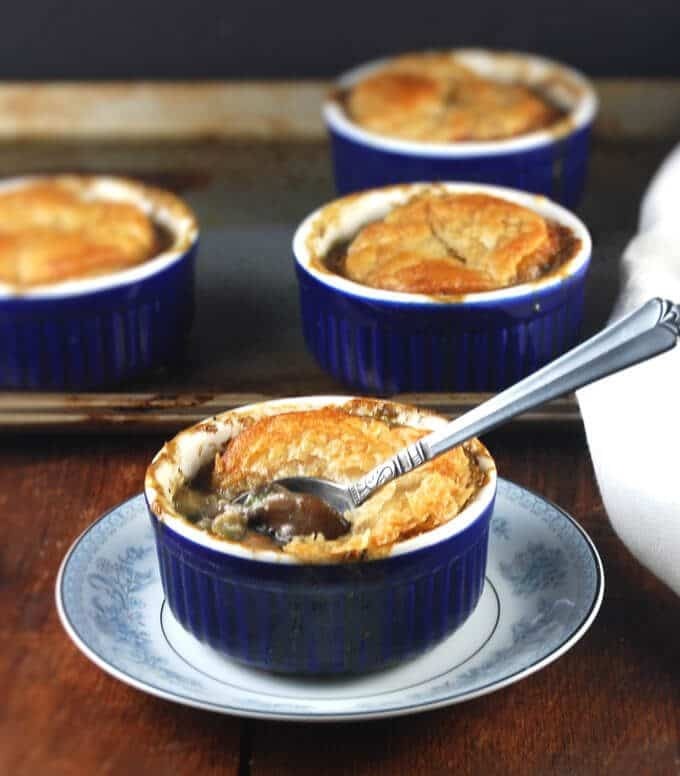 Hyperbole aside, these little mushroom pot pies are really cute. I like making individual servings, especially when we have few guests, but you can also bake this up as a single large pot pie. It would look just as good and taste just as delicious. The whole wheat pastry crust is easy to make, but if you’d rather not spend the time, go buy a store-bought crust. Most puff pastry crusts on the shelves are vegan, but read the label to be double-sure. 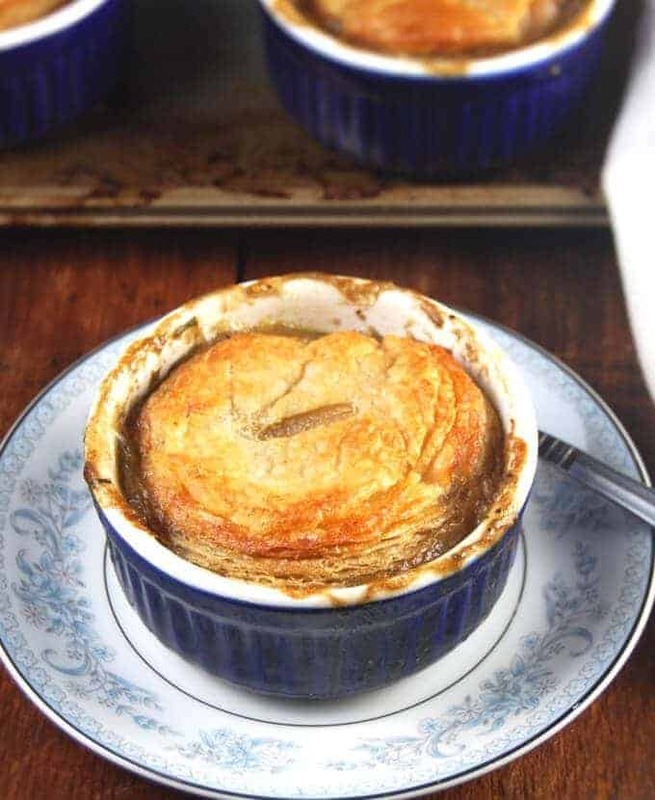 The filling for this mushroom pot pie is made with two types of mushrooms: fresh crimini and dried shiitake mushrooms. I used a combination because I wanted the chewiness of the dry mushrooms to add a satisfying bite and texture to this pie, but you can go all fresh, or all dry. The peas and carrots add more texture and flavor, but what gives this pot pie filling its incredible taste is a mix of savory herbs. I added a little of everything I still have in my Fall garden: rosemary, sage, thyme, and lavender. I also added some parsley for more freshness. But if you don’t want to do a mix, use one or two– I’d pick rosemary and thyme. 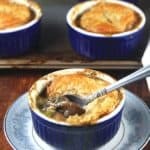 This pot pie is also a great dish to serve if you will have guests who are not vegan or vegetarian, because the hearty filling and the mushrooms stand in beautifully for meat. No one will miss the turkey. 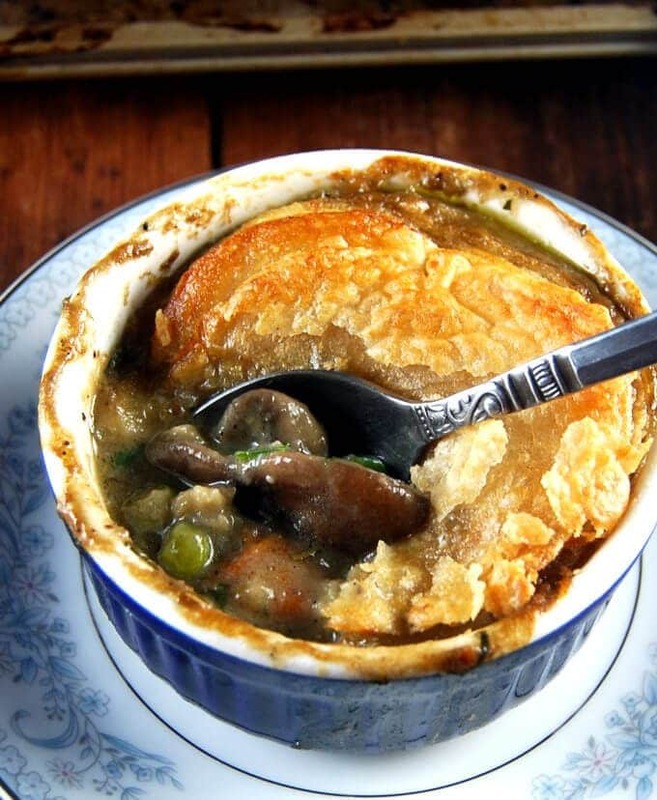 A savory, bubbling vegan mushroom pot pie with a whole-wheat puff pastry crust and a filling of peas, carrots, and two kinds of mushroom, all tied together by savory herbs. 1 oz dry shiitake mushrooms, slice the mushrooms and before slicing, reconstitute the mushrooms by placing them in a bowl and covering with 1 cup of very hot water. I place a glass or other weight on top because the mushrooms have a tendency to float. Leave alone for 30 minutes, then drain the mushrooms and reserve the soaking liquid. 2 tbsp of chopped fresh, savory herbs, like rosemary, thyme, and/or sage. If using dried herbs, use a total of 2 tsp. Place both kinds of mushrooms in a bowl and add ground black pepper, salt to taste, and the all purpose flour. Toss well to mix. Heat the 1 tbsp oil in a large saucepan. Add the mushrooms to the pan and saute for a couple of minutes, or until the mushrooms start to soften and brown slightly. Remove to a bowl. In the same pot, add the remaining 1 tsp of olive oil. Add the garlic, onions, carrots and celery. Add a pinch of salt and stir-fry, scraping the bottom of the pan for any bits of mushrooms or flour left behind. They will add wonderful flavor. When the onions and carrots start to soften but not brown, add the mushrooms back into the pot along with the peas, 1 tbsp of herbs and all of the mushroom stock. Stir well, bring to a boil, cover and cook for 20 minutes or until the carrots are tender. Add the remaining herbs and cashew paste. Stir well to mix. 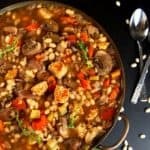 The stew should have thickened because of the flour you dredged the mushrooms in, and if it is getting too thick, add some water or stock to thin it out. Add salt and ground black pepper to taste. Stir in the parsley. Roll out the puff pastry and, using a glass or a cookie cutter, cut circles or squares large enough to fit over the ramekins or pie plate you will use. I cut circles just large enough to fit over the ramekins I used, but because the pastry shrinks when it cooks, the stew bubbled up through the sides of the ramekins. I don't mind it because it looks rather rustic, but if you want a more polished effect, make sure the puff pastry covers the top of the ramekin completely. Spoon the mushroom filling into the ramekins and cover the tops with the puff pastry circles or squares. At this point, for a prettier crust, I like to brush on a mixture of 1 tsp olive oil + 1 tsp nondairy milk on top of the crusts-- this makes them really golden, but it's completely optional. Cut a small slit in the top of the puff pastry in each ramekin. Place the ramekins on a baking sheet and place in the oven. Bake 15 minutes, then turn down the heat to 350 degrees and continue baking for another 10 minutes or until the tops are all golden and puffy. Remove from the oven, let stand 15 minutes before serving. Click here for a homemade puff pastry recipe. To make the pastry whole-wheat, sub half the all purpose flour with whole wheat flour. I made this last night for dinner and it was a success! I omitted the cashews because the flour created a lot of thickness as well as adding more veggie broth. the only problem was that there were no leftovers for today. i will be making this again this weekend in larger batches! thanks for sharign this recipr. It was delicious! Greetings once again. 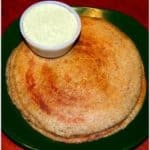 I am looking for the flourless version of Kulfi. Can you help ? Thank You for all your wonderful work of publishing your recipes and wonderful stories. Hi there, kulfi has no flour. It’s like an Indian ice cream. Perhaps you’re thinking of something else? Vaishali, These are simply delicious. We made them for dinner last night and not a single one survived until morning. Just awesome! Am I blind? I can’t seem to see where you add the peas in. Look forward to eating this! Hi Jessica, in step 5. Thanks! 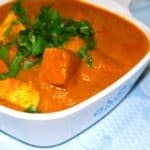 Hi Vaishali, this looks sooo good. My daughter is vegan & this hit just the right note for her Thanksgiving dinner. 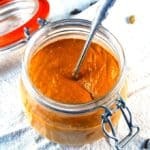 I was wondering if I could make this ahead of time & if so what would be the best way to store it? Hi Wendy, you can definitely make the stew ahead of time and bake the day of serving. I made this today and it was absolutely delicious. Such a warming and satisfying meal, especially with the weather getting colder. Definitely adding this pie to the regular rotation! Noa, how wonderful to hear. Thanks for letting me know! 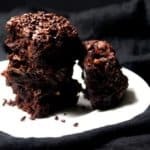 Hello, This recipe looks delicious Unfortunately I can not seem to find the recipe for the pastry anywhere and store bought will not be vegan. Is there supposed to be a link where you say: “either store-bought or made at home using this recipe.”? Because if there is mine is not working! Also, most store-bought puff pastry sheets are vegan, although it’s always a good idea to double-check the ingredient list. I love the flatware in your photos! Where did you get the spoons? 1/2inch dice. I moved to a new recipe format recently and it scrambled some things. Corrected now. Please forgive my ignorance. But, what does 2 cm mean for the carrots? Not at all, another scramble from when I moved the recipe. It’s just 2 carrots and 2 celery sticks. Thanks! oh, I do see the comment now on the “cm.” Thank you. Also, your website is the best! One thing I have found is that all your recipes are correct. They come out correctly and I might add, so delicously! Also, your methods in preparation are correct. You are a very fine chef! Thank you so much for helping this vegan girl and her husband eat well. Good food makes a home! Thanks for the kind words, Snowy! So glad you are making the ciabatta– my favorite bread! 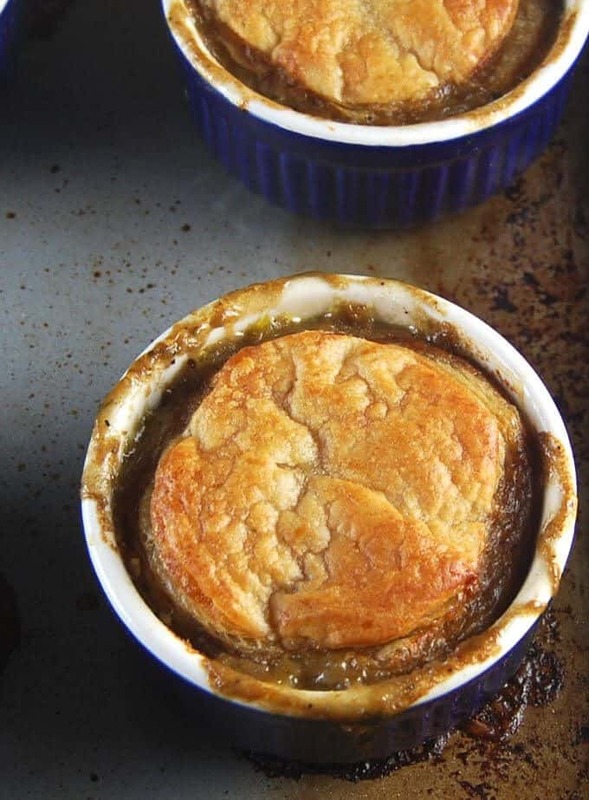 This Vegan Mushroom Pot Pie is fantastic! So satisfying and delicious. I won’t hesitate to serve this for a dinner party, that’s for sure. Love the last step of 20 minutes, browning the sauce — so good! The cashew paste worked just beautifully. Hi Vaishali! I was wanting to make these for my first ever vegan thanksgiving, but since I’m the only one in my family who is vegan I was just wondering how many ramekins this makes? I wasn’t sure if it was 8 or how many? Thank you! This was fab, thank you so much. Made it for a birthday celebration meal for my mother’s 78th last night (exactly a year after you posted the recipe, I realised today) and it was delicious. We’ve all recently changed our diet to a plant-based one, since July this year, and I was looking for a filling and tasty family meal. Was perfect with mashed potato (with oat cream) and steamed broccoli. Will definitely make it again—even my slightly sceptical 12 year old daughter loved it. Hi Andrew, that’s so great to hear. Happy birthday to your mom! I am making this for company in a couple of days. One guest is allergic to cashews. Is there a good substitute? Or can I just omit it? Looking forward to trying this! Hi Anna, use another nut like almond, if possible, or make a “cream” with pumpkin seeds, using the same proportion as the cashews. We made this for Christmas dinner and all loved it! Great, hearty comfort food. Thanks so much for sharing! If I was to use fresh mushrooms rather than dried ones, how much stock should I add, please? Use 3/4 cup of stock to replace the mushroom soaking liquid, since the fresh mushrooms will express a lot of liquid. Loved it!!! We will be adding this to our rotation. Thanks! Absolutely hits the spot! Kids and husband demolish these each time….it’s earned a spot on our favourites list! 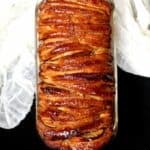 I was just wondering if this recipe would work for a large pie instead of 8 individual ones as I do not have the ramekins and I don’t want to go that expense right now. Thank you for sharing the recipe it sounds lovely. 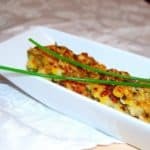 Can the peas be replaced with corn? Hi, could this be freeze for later? Would love to have this as ready meal for busy weekdays night. I have made this several times now, and it is so delicious! 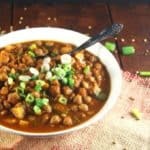 Beyond a doubt, one of our favorite recipe’s – even for my non vegan husband and son. When I am pressed for time, I just use a couple of different types of fresh mushrooms and some quality vegetable broth. Looks beautiful enough for company too!